Things will get worse for Sri Lanka especially in the international arena if the country fails to address the National question, Leader of Opposition R Sampnanthan told the Constitutional Assembly yesterday. "Sri Lanka knows very well that all the problems it has faced in the international arena, particularly since 2012, is because of its failure to manfully address the National question. 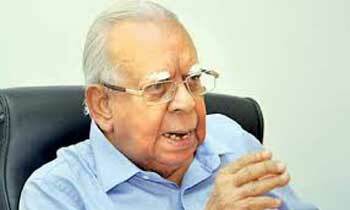 Things can only get worse; they cannot get any better if the same attitude remains," Sampanthan said. "Sri Lanka was able to garner the support of all the important players including the US, European Union and India to defeat the LTTE. The LTTE was banned in all these countries as a result. You made it look to the world that the LTTE terrorists were an impediment to a finding a political solution for the country. You assured the world that an acceptable political solution would be found after the defeat of the LTTE. Ask yourselves whether you can abandon the said assurances and commitments you made to the world," he added. There can not be any thing worse than where we were before. So, Mr.Sambandan stop trying to scare u into giving what you want. Even though this mangy government is determined into giving into your demands it will never be a reality on the ground. Minorities should enjoy every right that is enjoyed by the majority. Do the majority have a separate federal state?